You only have one chance to make a first impression, so you need to make it a good one. While the overall setup and design of your office and building are important, you also want to have modern waiting room chairs and modern reception furniture for this as well. This is very important, as it is going to ensure your guests and potential clients feel welcome inside of your office and are also impressed with your sense of style, design and success. The modern reception furniture is perfect for your company as it comes in several different looks and colors, but all of which fit in modern trends and clean lines. 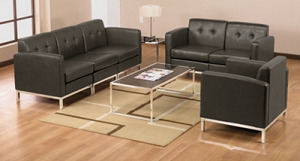 Modern furniture generally offers a more minimalist look and feel to it. However, unlike other go-arounds with minimalist in previous decades, this modern office furniture is exceptionally comfortable, all while making a striking impact on the visual sense of your customers. They are going to instantly recognize your eye for design and your ability to stay with the latest trends. This is important for many potential customers as they want to align themselves with a business that reflects cutting age and is also with what is trending and what the other major players in design are doing. All of this is possible through the help of modern waiting room chairs and other reception furniture that you can take advantage of inside of your office building, ranging from the waiting room, conference room, executive offices, to the interior of your office. If you enjoy modern waiting room chairs and are looking for the perfect fit, contact us today and we will be happy to walk you through the process with options available to suit your needs.